The 308 Winchester round can be used for sporting or hunting through bolt action and semi-automatic rifles. Each round in this case of 500 is loaded with a soft point bullet. While this may not be the best choice for longer ranges, SP bullets perform comparably to a hollow point bullet at closer ranges and are great for affordable target shooting and hunting applications. This ammo is Berdan-primed, lead core, non-corrosive, and exits the barrel at 2,626 feet per second. 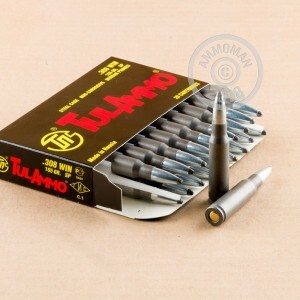 TulAmmo is manufactured in the Tula Cartridge Works facility located in Tula,Russia. 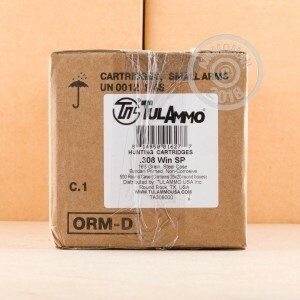 As one of the biggest manufacturers of small-arms ammunition, Tula continues to enhance and innovate their products to deliver affordable and rugged ammo to shooters around the world. Don't miss out on this opportunity for bulk 308 Win soft point ammunition! Good News! At AmmoMan.com all orders over $99 will ship for FREE! So order this case today and the shipping is on us! Good primer indentation. Both fired on the second time through. Also two others failed to feed, possibly just need polishing. This was soft point ammo. I was hoping the kids could hunt with it but probably not. Great ammo, will buy again. I bought 500 rds, & have now fired about 120 rds with no problems at all. I zero'd my Patrol rifle with a new scope, & am now training weekly before hunting season. I can recommend this ammo to others & every round fired worked as expected. 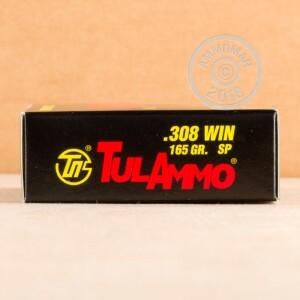 Very happy to have training ammo/bulk ammo again, great price and my rifle likes this ammo a lot. Very pleased! Ammo is accurate- hitting a 10" round steel target from 300 yards out to 450 yards-38 shots out of 40! Shots fired. I bought 500 rds & have had no problems. Shooting at paper & a steel target @ 200 yds getting tight grouping. Satisfied with my purchase, & glad to have a good supply of accurate ammo. Received my order very quickly. I went out same day to zero a newly mounted scope. Ammo works great & my rifle seems to like the 165 go rounds. Tried several different types of ammunition, cheap and expensive, but this ammunition at this price point delivered tight groups with the added bonus of being a hunting round. With my Cetme the brass cases do not fair well for reloading so this ammunition fits the bill for my needs with great accuracy and a price point that won't break the bank. I think this is excellent ammo for shooters with no interest in reloading. I fired 100 rounds thru my new DB10. Flawless! I am impressed with this ammo.